Doodle hair I DO CARE. Here’s how Pax stays so fluffy. A tired dog is a good dog to groom. Best time to do this is after your pup is worn out from a walk or from the park. Squeeze a small amount of cowboy magic in your palms, rub your hands together then through your pup's coat. You must always use a comb in addition to a brush for a doodle coat. 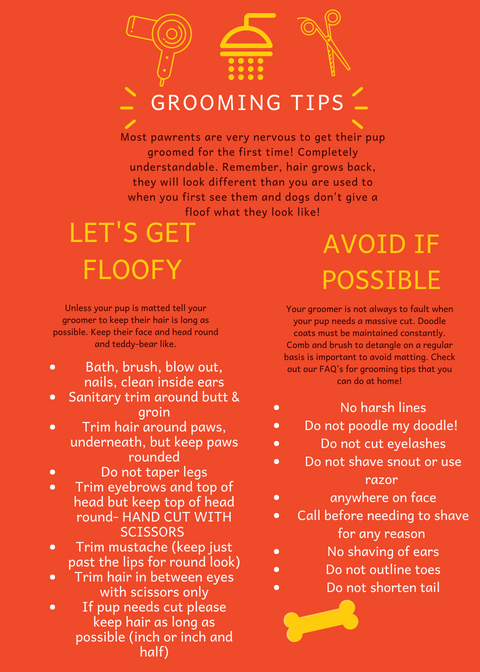 Start with a comb (check out FAQ on some of these products) and gently brush through your pup's coat while grabbing the fluff with your other hand and comb through. Do it this way so you aren't pulling at their skin. If you have some tangled areas or matts use the de-matter (in FAQ) to get through these tough areas. After this use the brush to fluff out your up. Make sure to give them lots of kisses and treats during/after. The general rule of thumb is that you should be able to comb through your pup's coat without much of a challenge. I brush Pax 1-2 times a day. ALWAYS after he rolls around while playing, after a bath, and after he's worn the harness for several hours. The younger you start this the better. You pup will just get use to it and will know it's part of his routine. In the beginning use treats such as bully sticks, teething bones, spoonfuls of PB, kings, anything to keep them occupied! Video to come!